What?!? Since when have the words "diet" and "satisfied" ever been uttered in the same sentence?!? Such is the power of soup! Turns out grandma was right: hot, savory, and comforting…soups have the power to heal your body…and the right kind of soup eaten at the right time can help you lose weight! Dieting can be challenging. Ninety five percent of people who attempt a diet end up regaining all of the weight they lost. Bummer. No doubt feelings of hunger, deprivation, and sometimes the expense of buying all the "fancy" foods and supplements is just too overwhelming. Here's what experts do know: To affect long-term changes in our body, we must eat well most of the time (there's no way around this), but we also have to enjoy what we're eating and we need to feel physically satisfied (i.e. not ravenous 3 minutes after finishing a meal). I LOVE low-calorie, nutrient-dense soups because they solve all of those challenges! A good soup is delicious and comforting. When I make a veggie soup it brings back childhood memories of being at my grandma's house (she nearly always had some sort of soup with meals). Soups are filling, which is incredibly important when you're trying to lose weight...no one likes to be hungry. Soup is one of the easiest and least expensive ways to add more nutrient-dense veggies into your diet. They keep in the refrigerator and/or freeze well, so doubling or even tripling the recipe lends itself to easy meal prep. Soup also forces you to SLOW DOWN while you eat (have you ever tried to eat hot soup on the run? ), which is so important for satiety and proper digestion! Below is one of my favorite soup recipes. It tastes great, is low in calories, high in satiating fiber, and loaded with nutrient-rich vegetables. It’s also inexpensive to make (especially if you compare it to buying the healthier varieties of canned soup at the grocery store or going to a restaurant like Panera!) and keeps well. Fun Health Experiment: eat a bowl of this soup before lunch and dinner every day for a month. It’s that simple…no need to focus on changing or eliminating anything else…just add the soup twice per day and see what happens! Don't be overwhelmed by the long ingredient list for this soup. I try to add every vegetable under the sun, but you don't have to! 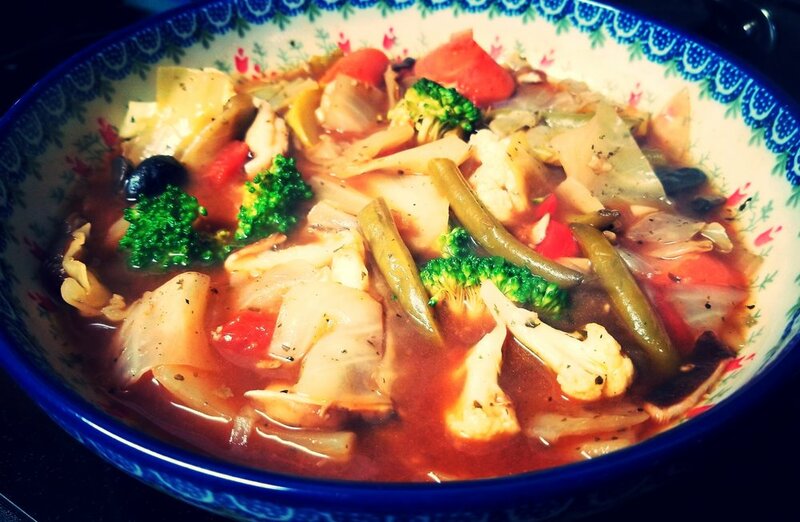 The beauty of this soup is that you can omit or add veggies based on your tastes and what you have on hand. If all I have on hand is broccoli, carrots, and cauliflower, that's all I add to my soup! It's also really annoying when you buy fresh veggies and they start to go bad, right? Soup solves it! Making a soup is a great way to use up veggies that are nearing their shelf life...you end up saving more money AND create less food waste! In a VERY large pot (don't skimp on the pot...it's going to be really full) heat olive oil over medium heat and cook onion and garlic until slightly softened. Add carrots, cabbage & green beans and cook an additional 5 minutes. Stir in bell peppers, mushrooms, celery, undrained tomatoes, broth, tomato paste, bay leaves and seasonings. Simmer 20 to 30 minutes. Finally, add in zucchini & broccoli. Simmer for an additional 5 to 10 minutes or until broccoli is bright green. Remove bay leaves and serve hot! I'd love to get your comments and feedback! Did you make this recipe? What did you add or omit? Did you try the 30-day "health experiment"? If you live close to Spencer or Medina, Ohio and want more helpful tips for fat loss, easy recipes, and fun "health experiments" to try, please join me on May 3rd for a weight loss seminar! Click here for the details and to get registered!